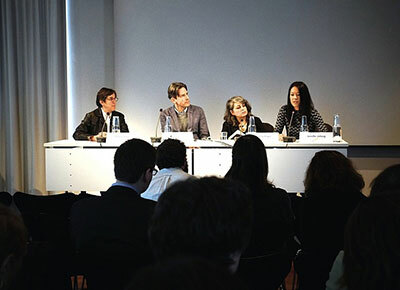 Associate Professor Jennifer Johung and Assistant Professor Elena Gorfinkel traveled to Berlin during the first week of November to present papers at the annual World Picture Conference held this year at the Institute for Cultural Inquiry (ICI Berlin). They organized a panel on “Dying” in association with the conference theme of “Abandon.” The panel explored dying as a form of abandonment, of abandoning life. Dying capitulates, enacts, and offers a decaying, a waning, a drifting or drawing away, and a movement towards a threshold, an ending. In dying, there is a letting go, a moving towards, a translation of matter, time, scale, body, ecology. In dying, life proceeds towards and seeks out non-life, a simultaneous negation and revision of the living and its recognizable forms towards the formally diffuse and uncontained, towards a symbiosis of matter with matter. Through dying, the visible heads into the invisible, in time heads towards out of time, as opposing states reach closer to one another. Jennifer’s paper, “Non-Life Matters,” considers the ambiguous boundaries of non-life in the context of biological and biotechnological manipulations of matter. Attending to protocells, thrombolites, and embryonic stem cells, she posits a dependent symbiosis between living and non-living matter, while examining the ways in which non-life seeks out other forceful arrangements beyond an exceptional distinction with life.